"I am extremely proud of our dedicated and hardworking team." 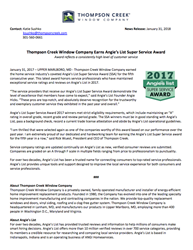 Thompson Creek Window Company earned the home service industry's coveted Angie's List Super Service Award (SSA) for the fifth consecutive year. This latest award honors service professionals who have maintained exceptional service ratings and reviews on Angie's List in 2017. "The service providers that receive our Angie's List Super Service Award demonstrate the level of excellence that members have come to expect," said Angie's List Founder Angie Hicks. "These pros are top-notch, and absolutely deserve recognition for the trustworthy and exemplary customer service they exhibited in the past year and overall." Angie's List Super Service Award 2017 winners met strict eligibility requirements, which include maintaining an "A" rating in overall grade, recent grade and review period grade. The SSA winners must be in good standing with Angie's List, pass a background check, record a current trade license attestation and abide by Angie's List operational guidelines. "I am thrilled that were selected again as one of the companies worthy of this award based on our performance over the past year. I am extremely proud of our dedicated and hardworking team for earning the Angie's List Super Service award for the fifth year in a row," said Rick Wuest, President and CEO of Thompson Creek. For over two decades, Angie's List has been a trusted name for connecting consumers to top-rated service professionals. Angie's List provides unique tools and support designed to improve the local service experience for both consumers and service professionals. Thompson Creek Window Company is a privately owned, family operated manufacturer and installer of energy-efficient home improvement replacement products. Founded in 1980, the Company has evolved into one of the leading specialty home improvement manufacturing and contracting companies in the nation. We provide top-quality replacement windows and doors, vinyl siding, roofing and a clog-free gutter system. Thompson Creek Window Company is headquartered in Lanham, MD, and manufacturers our products in Upper Marlboro, MD, employing more than 400 people in Washington D.C., Maryland and Virginia. For over two decades, Angie's List has provided trusted reviews and information to help millions of consumers make smart hiring decisions. Angie's List offers more than 10 million verified reviews in over 700 service categories, providing its members a credible resource for researching and comparing local service providers. Angie's List is based in Indianapolis, Indiana and is an operating business of ANGI Homeservices.